It gives me great pleasure to bring a familiar (smiling) face back onto Cupcakes Take the Cake. You might've seen Nora's cupcake kebabs at our cupcake picnics, 5-year anniversary party, World Record Longest Cupcake Kebab , and wherever else she chooses to spread the joy. Even when they're not her signature cupcake kebabs, her cupcake creations are incredibly complex and creative each time. But I'm tempted to say the mastermind might be sweeter than her products. I mean, look at her. Cupcake patches on jeans? Stick a cupcake kebab in me, I think I just went into Cute Overload cardiac arrest. Read on for her story, and a video of Nora explaining her cupcake kebabs. 1. How did you get into cupcake baking? I’m involved with theatre and as a way of breaking the ice with new cast members I would bring treats (including cupcakes) to rehearsals and during the show run. 2. Do you have a signature cupcake? 3. What kind of cupcake do you plan to bake next? I love experimenting with flavor combos. I see that there is a Hot Tamale Cotton Candy on the market and would like to create a Cotton Candy Cupcake based on that flavor. Often I find inspiration from whatever event I’m creating the cupcake for. I like to create by theme. 5. Describe a memorable (funny/disastrous/life-changing) cupcake baking moment you've had. When I shared my Cupcake Kebabs at the CTTC picnic a year ago I was a little worried about how they would go over and then when they were a hit and went viral (thanks to CTTC) I just couldn’t believe it! 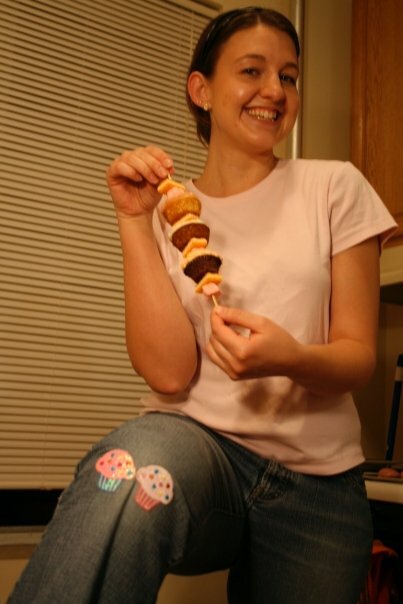 It’s crazy to think that there are people all over creating Cupcake Kebabs inspired by my idea. 6. Give one piece of cupcake advice for other bakers out there. Be patient. Anytime I’ve tried to take a shortcut when baking it doesn’t turn out well and then you have to start all over again anyway, so give yourself plenty of time to enjoy the process of creating something wonderful and tasty to share. Thanks, Nora! Stay tuned for next week's Cupcake Baker of the Week. Leave us questions, feedback, and suggestions in the comments below. If you would like to nominate someone to be featured, e-mail us at cupcakestakethecake@gmail.com with "Hey Melissa! Check out this Cupcake Baker!" in the subject title.